Ethiopia Burka Gudina and Zambia Mafinga are the latest craft coffee offerings from Columbus coffee roaster Crimson Cup Coffee & Tea. The new coffees are available on the company's website and at Crimson Cup Coffee Houses in Clintonville and Upper Arlington. These Ethiopian and Zambian coffees are among the best current-crop coffees we’ve tasted. We’re excited to add these fine African coffees to our craft coffee line. Columbus, Ohio coffee roaster Crimson Cup Coffee & Tea has introduced Ethiopia Burka Gudina and Zambia Mafinga to its premium line of craft coffees. 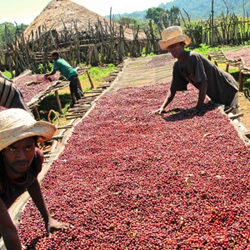 The Ethiopia Burka Gudina coffee grows on the Burka Gudina Estate in the Limmu District of Ethiopia’s Jimma Zone. Owned by third-generation grower Ibrahim Hussein, the 150-hectare estate produces heirloom varietal beans growing at altitudes of about 6,069 to 6,561 feet. It employs 120 people during the peak season. Certified by the Rainforest Alliance, Crimson Cup’s Zambia Mafinga coffee grows on two separate estates at altitudes of 4,390 to 4,590 feet in the Mafinga Hills sub region of Zambia’s Northern Province. The two estates, Kateshi and Isanya, both grow the Catimor 129 varietal, which is processed at a mill operated by Kateshi to create this blend. Crimson Cup roasts the beans to an American roast level to bring out flavor notes of tangerine, crème brûlée and lemon peel. Ethiopia Burka Gudina and Zambia Mafinga coffees can be purchased on the Crimson Cup website and at Crimson Cup Coffee Houses in the Upper Arlington and Clintonville suburbs of Columbus.